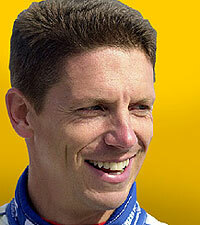 [gt3r] You were part of the first team to win a championship in 2000 for the GT3 R, you also won the drivers championship. any comments? I had everything you need to win a championship in 2000. A great team in G&W Motorsports, a great co-driver - Darren Law, and a GT3 R. We won five races and finished on the podium in all nine. It was a dream season. [gt3r] You also have won the Porsche Cup , you are the 3rd of 4 Americans that have won this, has that been a goal, or was it somewhat of a surprise to find yourself in that position? When the season started I didn't give it a thought, but in May or June Alwin Springer told me that I was leading in the points. Of course, I knew about the Porsche Cup, but it never occured to me that I would be in a position to win it. Porsche has such a storied history in motorsports that it is an honor just to be a part of it. [gt3r] Having driven the GT3 cup cars in World Challenge, Grand Am cup, Grand Am, and ALMS, what can you say about the GT3 R compared to the other 996 vehicles? 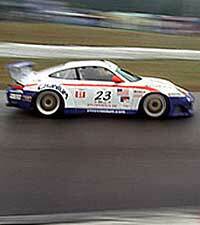 to previous Porsche GT cars such as 993 RSR? 964 RSR, etc? Until I drove the GT3 R I thought the RSR was the greatest car ever built. Of course, in retrospect the GT3 R is a huge upgrade, but that's progress. I think the 996 and the 993 require different driving techniques to go fast. The 993 liked to be thrown around. It responded to aggressive inputs. The 996 models require a softer touch. The GT3 R and GT3 Cup car respond to a smoother driving style. The differences between the GT3 R and the GT3 Cup car are difficult to detect from the cockpit. ÊIn World Challenge we are able to upgrade to the GT3 R suspension, but we have to run shaved street tires. Honestly, the GT3 Cup car that I drove in World Challenge this season was so good that it seemed like a GT3 R.
[gt3r] You have raced extensively in Porsches, what is your favorite? why? GT3 R, but the raw power is just plain fun. [gt3r] Gearbox? Inside ergonomics? Driver comfort? These days I mainly drive the 996 models unless I'm hanging out at a vintage race. I love the feel of getting into a GT3 R or a GT3 Cup car. ÊIt's so familiar that I feel comfortable as soon as I slide into the seat. The cable shifter is so precise that I'm completely comfortable skip shifting or running through the gears. [gt3r] Other comments or insight? Lately, my career has been going well and I often get asked if I'll be driving a portotype anytime soon. It would be nice, but if I spend the rest of my career driving GT3 R's I'll be a happy guy.